El Nino Development Slows. Seattle Swelters. After spending the last week of May and most of June on the positive relative AAM (El Niño) side of the Global Wind Oscillation (GWO) phase space, the GWO slipped back into negative relative AAM territory the last week of June and stayed there most of July. Following the lead of the atmosphere, development of the current El Niño also slowed in July. During July there was little change in equatorial Pacific SST anomalies; the Southern Oscillation Index (SOI) became strongly positive; and the June-July Multivariate ENSO Index (MEI) value, reported August 5, increased by only 0.05. However, during July, enhanced tropical convection shifted from the western Indian Ocean to the west central Pacific, extending from about 140E to the dateline. This was followed by the development of a strong Westerly Wind Burst (WWB) in the western Pacific. 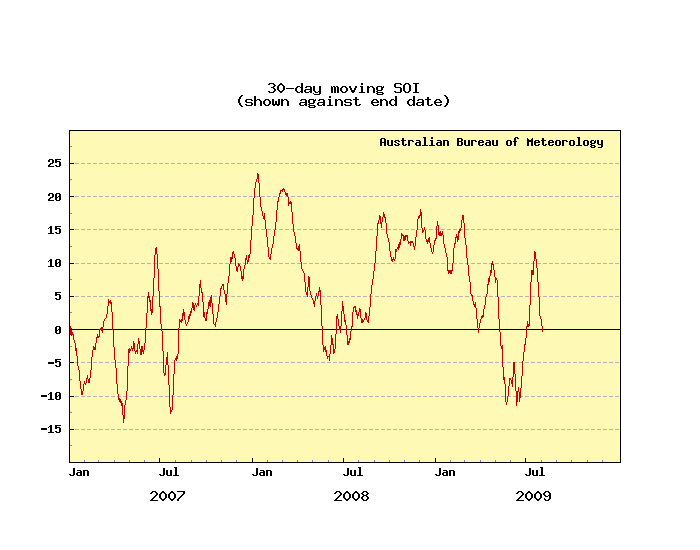 Coincident with the WWB was a dramatic reduction in the SOI, and an an orbit of the GWO to a somewhat higher global relative AAM state. These events are consistent with a developing El Niño. According to the El Niño/Southern Oscillation (ENSO) Diagnostic Discussion issued August 6 by the Climate Prediction Center/NCEP/NWS, "current conditions and model forecasts favor the continued development of a weak-to-moderate strength El Niño into the Northern Hemisphere Fall 2009, with the likelihood of at least a moderate strength El Niño (3-month Niño-3.4 SST index of +1.0°C or greater) during the Northern Hemisphere Winter 2009-10." How often are Summer temps hotter in Seattle than the San Fernando Valley? From July 26 to August 3, 2009, the Seattle area suffered through a heat wave that broke numerous records, including several "all-time" temperature records. On July 29, 2009 Sea-Tac reached 103°F, Bellingham 96°F, and Seattle WFO (Sandpoint) 105°F, the highest temperature ever recorded at these stations.